Seven new modes, arena workshops and more. Update: With the update rolled out, Rockstar has added more detail on what Arena War entails. The seven new modes are called Carnage (vehicle deathmatch), Flag War (capture the flag), Wreck It (a trap-heavy racing mode), Tag Team (tag in and out of the fight with another player), Games Masters (one team hits checkpoints while their opponents control hazards to stop them), Here Come the Monsters (survival mode against an opposing team of monster trucks) and Hot Bomb (sounds filthy, but you pass the bomb by crashing into other players). The update also adds the Arena Workshop, where you can customise these vehicles. The workshop costs a minimum $995,000 fee from what I can tell, and they're based inside the Maze Bank Arena. This isn't a mandatory purchase to participate in the new Arena War content, but you'll need one to have a 'career' in Arena War and earn AP, which unlocks further rewards. You'll also get two new shirts for your trouble by logging in this week. Original story: I feared GTA Online would die a slow death with the arrival of Red Dead Redemption 2's multiplayer mode on consoles, but it doesn't look like that's going to be the case just yet. 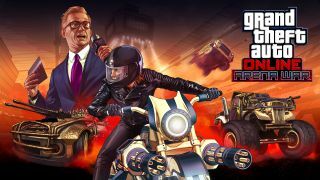 Today, GTA gets the Arena War update, where players battle with custom vehicles inside the long-dormant Maze Bank Arena. Arena War will encompass seven new modes. Rockstar says these all-new vehicle types were built just for Arena War. Curiously, Arena War has its own progression system called Arena Points. You'll be able to use these to rank up and get access to new 'toys', which can be used in or out of the arena. I'm assuming the vehicles will be for sale on Warstock, too, which would be welcome news to me as someone who has no interest in GTA Online's sports cars, but loves novelty vehicles like the Vigilante. Vehicle combat has been a fixture of a bunch of past GTA Online modes—Motor Wars or Dogfight Mode, for example—so it's interesting to see Rockstar double down on it. After its launch on PC later today, I'll throw a few hours at Arena War to see if it's worth jumping back into the game for. I say this as someone who hasn't played too much GTA since the After Hours update earlier in the year. If you ever need an injection of cash in GTA Online, consider checking out our comprehensive guide on making money.